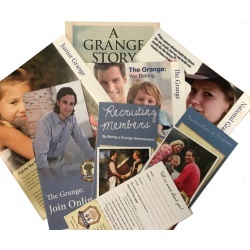 Grange brochure complete with adult membership application. 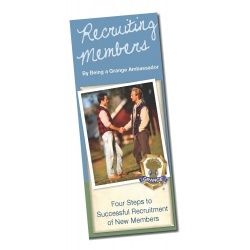 Brochure which features 4 steps to successful recruitment of new members for your Grange. 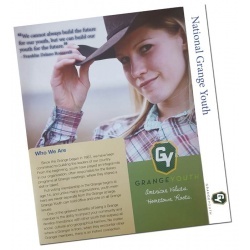 Grange Youth brochure complete with membership application. 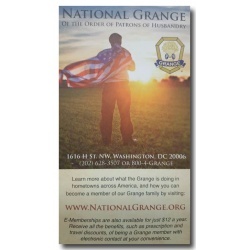 E-Membership brochure for electronic Grange membership. Member Benefits brochure offering an assortment of benefits from discounts on rental cars to insurance. Membership Rip Cards are designed to help you and your members meet membership goals. These 4" x 6.5" high full color cards come with three different photo images. 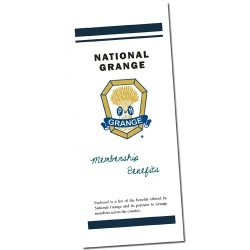 On the front is a membership pledge area, a place to write the name of the person you are planning to invite to join the Granges, as well as the photo, new tag line, and the Grange logo and motto. 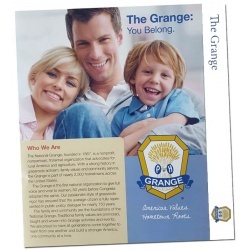 The back includes prompts for elevator speeches, and a ready-made postcard for the member to return to their Grange or State Grange detailing who they asked to join and the result or an area to include the person's contact information if they wish to receive more information about the Grange. Sold in packs of 25, assortment of all photos. 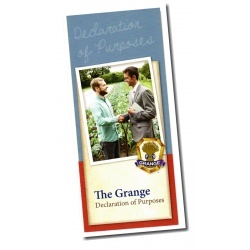 Brochure featuring the general objective and purpose of the Grange. 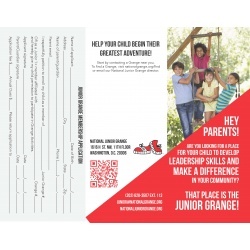 Junior Grange brochure complete with membership application.